VietNamNet Bridge – More than 237 herds of red-shanked douc langurs (Pygathrix nemaeus), comprising over 1,300 individuals, were reported living in the Son Tra Nature Reserve in Da Nang. The city’s Union of Science and Engineering Associations, in co-operation with the Biodiversity Conservation Centre of GreenViet, an NGO in Da Nang, made the announcement at a scientific conference on langur research at the reserve yesterday. According to biologists from the Union and GreenViet, the research took a year to complete and was based on daily field trips to the 4,300ha reserve, 10km from the city centre. Head of the research team, Bui Van Tuan, said the findings had shed light on the existence of the endangered langurs and current protection provided by the reserve. “We once again confirmed that the Son Tra Nature Reserve is unique in Viet Nam – a home to the largest population of red-shanked douc langurs,” Tuan said at the conference. “There were two research reports issued on the endangered langurs from 1977-2010 in a small area, but the number of langurs was reported as being around 208 individuals,” he said, adding that biologists investigated 16 routes into the jungle spanning a total length of 136km. He said the research revealed that the Son Tra Nature Research was an ideal area and provided safe shelter for the langurs – a species found only in Laos and Viet Nam. Tuan also said a large percentage of the endangered langurs live in northern parts of Son Tra peninsula, on an area of 3,100ha. However, the National Administration of Tourism designated Son Tra Mountain a national tourism site, and it will host a luxury eco-tour resort complex and 4.6 million tourists by 2030. The tourism development plan, which was announced in March, includes 1,600 luxury hotel rooms to accommodate 300,000 tourists, with expected revenues of VND4.3 trillion (US$190.3 million). As planned, the Son Tra Peninsula, which covers an area of 4,439ha, will have 1,056ha earmarked for development as a national eco-tourism and luxury resort in central Viet Nam. Biologists and scientists warn that the development of concrete buildings would soon push the endangered primates into extinction. Tuan also warned that human activities including mass tourism, construction, illegal hunting and logging would result in a decline of the langurs in Son Tra, and damage the reserve in the future. Biologist also warned that monkeys living in the reserve could break into the resorts, causing trouble for tourists and management. Disruptive human activities in recent years have badly affected the lives of the primates and wildlife in the reserve. Six monkeys were killed by motorcyclists in 2015-17, and two cases of illegal hunting were uncovered in the area, with two red-shanked douc langurs killed for money. Around 10 hectares of forest was illegally logged for buildings in three cases between 2014-16. Thousands of traps and tonnes of rubbish have been collected by local rangers and volunteers over the last two years. Tran Huu Vy, director of GreenViet, said the langurs in Son Tra Nature Reserve were declared endangered by the International Union for the Conservation of Nature (IUCN) in 2013, but the species has recently been classed Critically Endangered (CR) – nearly extinct. Vy said GreenViet spent 10 years researching biodiversity in the reserve and the protection of the langurs. He claimed that development of hotel and resort projects in the reserve would damage the rich biodiversity from the mountains to the coast. The nature reserve has shrunk from over 4,300ha to 2,500ha to make room for the development of dozens of resorts and hotel projects, and over 20 streams in the reserve have dried up – the worst conditions for 20 years. Vy said land earmarked for tourism development in the reserve would claim more areas of the langurs’ habitat as well as damage an ecological system on land, as well as the seaweed and coral reefs in Son Tra. Last month, Huynh Tan Vinh, chairman of the city’s tourism association, sent a petition to the Prime Minister, asking for changes to the Son Tra Master Plan. The Government asked the city to review and provide a scientific assessment of environmental impact and biodiversity in Son Tra Nature Reserve, and a detailed report must be sent to the PM before May 30th. 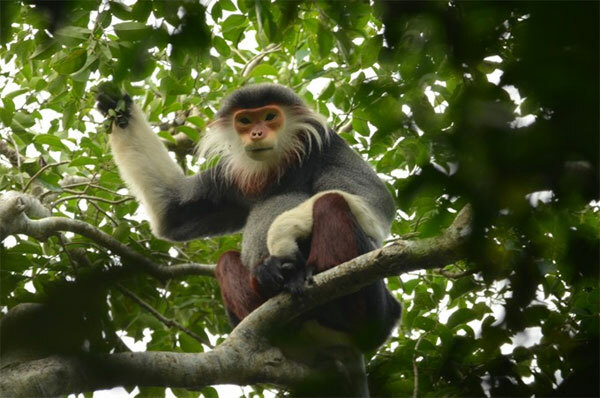 The city has approved a plan through 2030 on the protection of biodiversity in Son Tra Nature Reserve, and selected the red-shanked douc langur as the city’s symbol of biodiversity at the Asia Pacific Economic Co-operation Summit (APEC) in Da Nang this year. 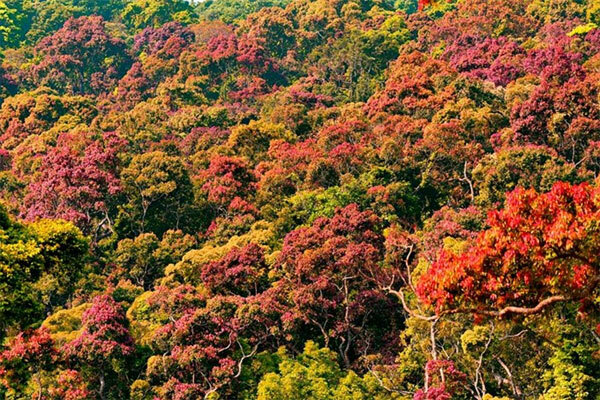 The Son Tra Nature Reserve, which is 600m above sea level, is known for its rich biodiversity, with 287 animal species and 985 plant species. GreenViet is also co-operating with the Frankfurt Zoological Society of Germany, San Diego Zoo Global in the United States and the IUCN to protect the red-shanked douc langurs through long-term campaigns.